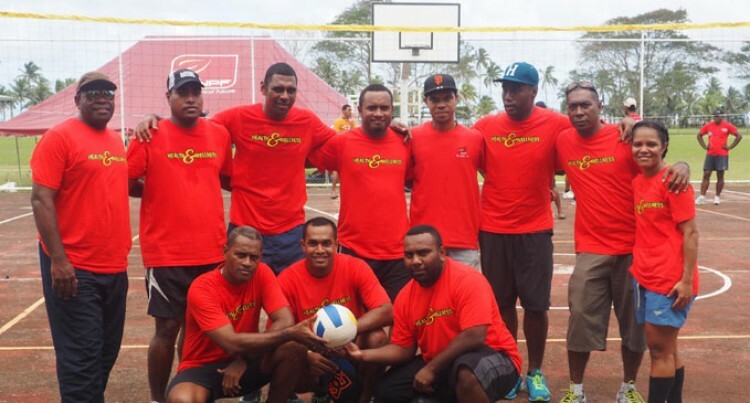 The Suva Grammar School ground in Nasese was a hive of activities yesterday as staff from the Colonial War Memorial Hospital and the Fiji National Provident Fund (FNPF) converged for a wellness programme. CWM Hospital General Manager Soro Toutou said the programme was an initiative by the Minister for Health and Medical Services, Jone Usamate, for leaders to take some action and champion the wellness programme. “This is a combined wellness programme with CWM and FNPF. It’s another way to show our fight towards eliminating NCDs – the highest cause of deaths in the region. So I guess here we are trying to show Fiji that we can champion wellness and good health,” Mr Toutou said. Mr Toutou said other ministries and corporate bodies should also take up similar initiatives to promote wellness health in their various workplaces. “Yes, definitely. I think it is about time that other ministries and departments come together and have organised games with other corporate bodies to improve relationships, networking and know more about their services,” he said. Sporting activities such as touch rugby, netball, volleyball, basketball, darts and soccer was part of the programme.